Dr. Girish Dahake, Lee Stratford, and Frank Kuster (pictured above from left to right) lead Ambrell's three global Applications Laboratories. Dr. Girish Dahake, Senior Vice President of Global Applications, is based at Ambrell's Scottsville, NY USA headquarters. Lee Stratford leads Ambrell's Applications Laboratory in Cheltenham, UK. 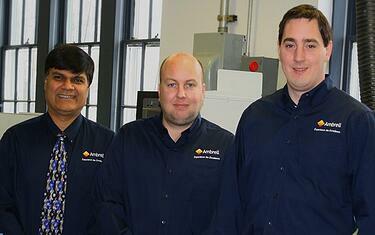 Frank Kuster heads up Ambrell's Applications Laboratory in Hengelo, The Netherlands. You can read about Dr. Dahake by visiting our website. Be on the lookout for new blog postings with biographies featuring Lee Stratford and Frank Kuster. Additionally, Ambrell's Applications Laboratory at its United States facility is in the final stages of a significant renovation, and we'll be featuring those enhancements on our blog too. Our team is renowned for developing innovative and effective heating solutions that produce extraordinary results. By sharing a bit more about our team, you'll see why THE LAB delivers performance excellence in application after application. Learn more about THE LAB and how it can help enhance your heating process today!